Wapakoneta was an important site to the Ottawa tribe before they were forced from Ohio. 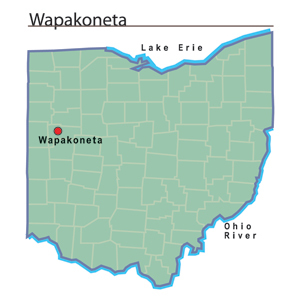 By 1798, the Shawnee tribe had made Wapakoneta one of their principal towns. By 1808, there were reports of more than five hundred Shawnee, Seneca, and Ohio Seneca-Cayuga living at Wapakoneta. Among them was Black Hoof, an important Shawnee leader. The American Indians of Wapakoneta adopted agricultural methods that missionaries from the Society of Friends (Quakers) had introduced to them. The natives worked to prove that they had indeed adopted the life of the white settlers. Wapakoneta was the location of the first sawmill and gristmill in northwest Ohio. In 1810, the United States sent a Federal Indian Agent to help the American Indian people, though the federal government later removed the agent for failing to submit appropriate reports. The Shawnee and Seneca continued to live at Wapakoneta until the United States government forced them to leave in 1831. The Treaty of Wapakoneta and the Treaty of Lewistown resulted in the removal of the Shawnee and Seneca to Kansas. Anglo-American settlers quickly moved onto the former Seneca and Shawnee lands. In 1848, the Ohio legislature created Auglaize County out of parts of Mercer and Allen counties. Wapakoneta became the county seat. For the next 150 years, Auglaize County residents primarily sustained themselves through agriculture, although several additional industries existed in the city by the late nineteenth century. Wapakoneta had 2,800 residents in 1880 and saw an oil and natural gas drilling industry develop in the area. It was also claimed that the town produced more butter churns than any other single location in the United States during this same time period. In 2000, more than nine thousand people called Wapakoneta home. Many residents found employment at the Goodyear Tire and Rubber Company or Amcast. Among Wapakoneta's most famous inhabitants was Neil Armstrong, the first man to walk on the moon. The Neil Armstrong Air and Space Museum, operated by the Ohio History Connection, is located in Wapakoneta.